In order to create the PE boot disk, you will need to download the ADK from Windows. This will download the PE environment. What is needed is a boot cd that gives you a PowerShell prompt and network access. You can download the Microsoft ADK from this page: https://docs.microsoft.com/en-us/windows-hardware/get-started/adk-install or the download link here: https://go.microsoft.com/fwlink/?linkid=2026036 What you are downloading here is the setup file that will then download everything else. All the files downloaded will probably be around 7GB. I believe you should be able to use a Windows Server Install CD and go into recovery mode. I have not tested this yet, however. 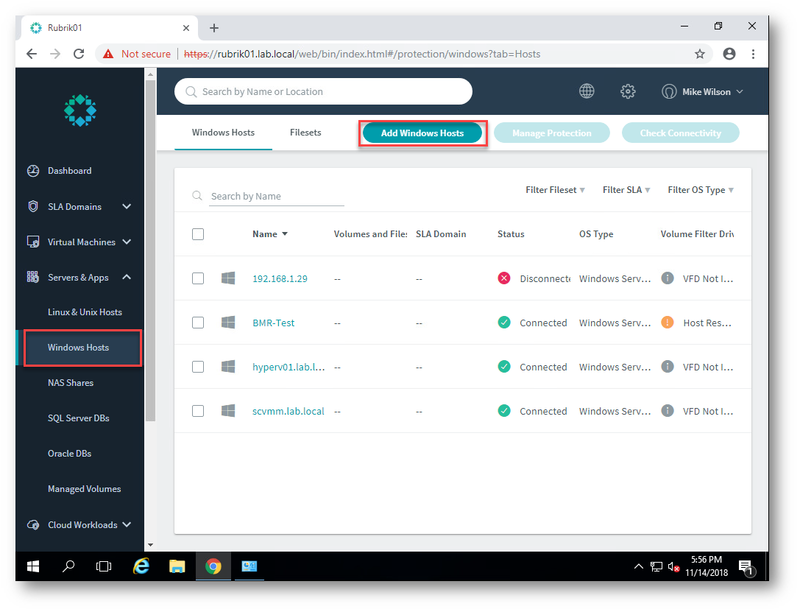 Once you download the ADK and install that, you will need to download Rubrik’s PE install tool. This is a PowerShell script that will aggregate the files needed and compile them into an ISO that can then be used on a USB key etc. Once downloaded, you need to unzip the files directly on your C drive. Those two folders will be created. Now open a Admin PowerShell prompt and run the following – You may need to adjust the beginning to account for where the .ps1 file is. It will then begin running the ISO creation process. At the end of this a bootable ISO will be created in the location shown in the figure (you specified in the PowerShell command above C:\WinPEISO). You will use this CD to boot the machine to restore the physical machine later on. Normally the next parts would already be done, since you are interested in the restore. I put this in though, since I was creating everything as I was writing this post and someone out there might not be aware of how to protect the machine in preparation for BMR. The next step is install the Volume Filter Driver. You can do that by clicking on the checkbox in front of the machine and then clicking on the ellipsis in the top right corner. 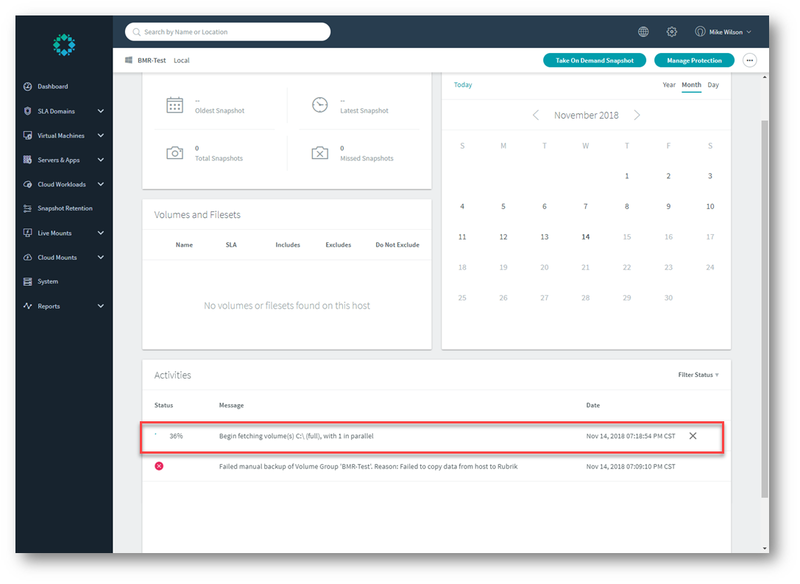 To be clear, you don’t “need” the Volume Filter Driver for this to work, but it does a better job in keeping track of the changes and should allow you to take faster incrementals. It performs the same job as RCT in Windows or CBT in VMware. The host will need to be restarted (as you can see in the picture on the right side. It is really easy to tell if the VFD is installed with the column on the right. It may take a few minutes for Rubrik to update to the fact you rebooted). Once the host is restarted, you will need to take a snapshot of the machine. 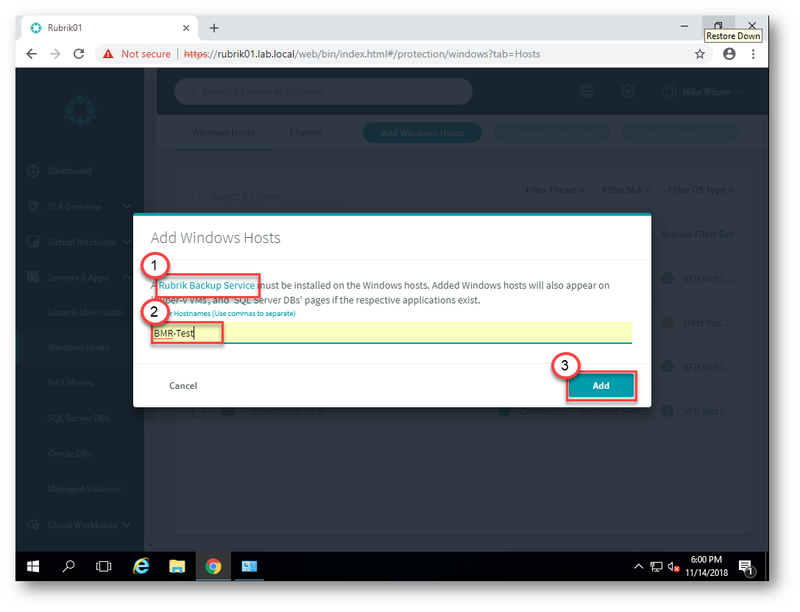 You can do this by clicking on the Windows Host name itself and clicking the “Take On Demand Snapshot”. I’m going to click on Volumes and then the ‘C’ drive. The next screen is to add the machine to an SLA protection policy. You don’t have to, but you should. This will keep it continually protected according to the SLA you choose. Click on “Finish” and watch the magic occur. So in case you were wondering….my first error above was because the machine was not part of a domain. Some of the permissions required, need the machine to be part of a domain. 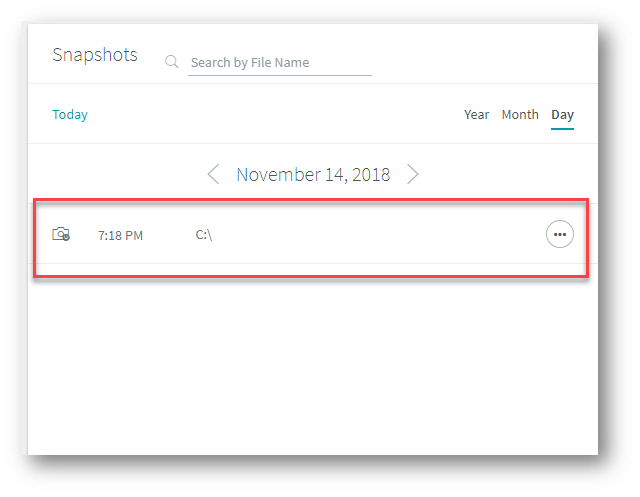 Once the backup has been completed, you will see a dot on the calendar telling you that a snapshot exists on that day. In order to restore this, click on that dot. You will then see the snapshots available, shown. At the end of the line you have an ellipsis you can click on to take action on it. 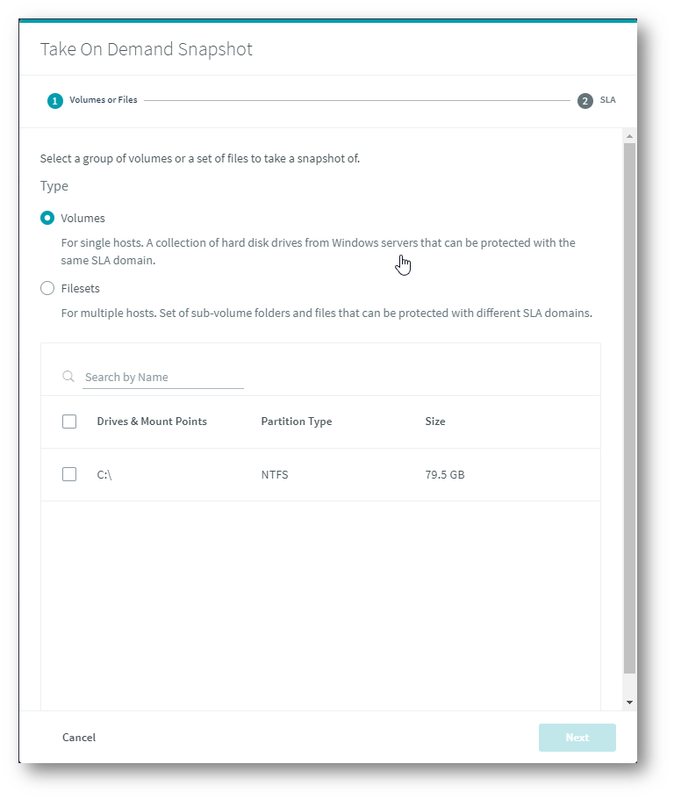 Now you CAN choose individual files with the “Recover Files” option but that won’t help you perform a Bare Metal Restore. The option you are looking for is “Mount”. When you do choose “Mount” you will get a new popup. This will show the drives available. 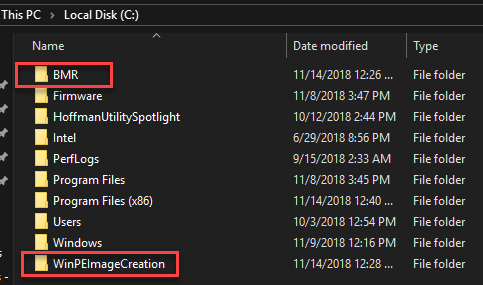 When you click on the C: drive and any other one you need, click on “Next”. The next window gives you more options. 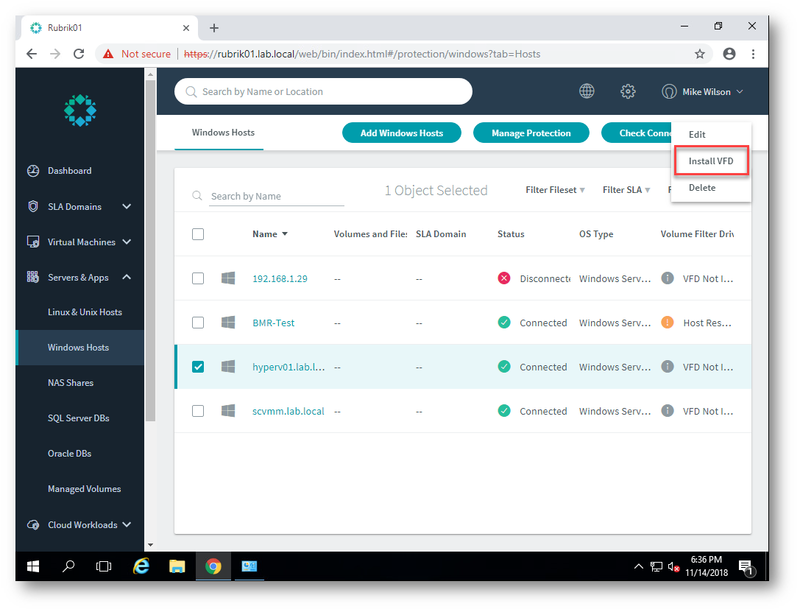 You can either mount the snapshot on a host (If you are doing just a volume that needs to be restored) or, since we are doing a bare metal restore, click on No Host on the bottom to expose an SMB share with the VHDX file. In order to preserve security around the share, you will need to enter who is allowed to access the share. You do that by entering in an IP address. ONLY the IP Addresses you input will be able to access the share.. You probably don’t know what IP address you need to put in here yet, so start your physical machine up with the PE CD and then use ipconfig in the open command line window to find the IP to use. After the drive in Rubrik is mounted, you can find it by going to the Live Mount menu on the side and selecting Windows Volumes. 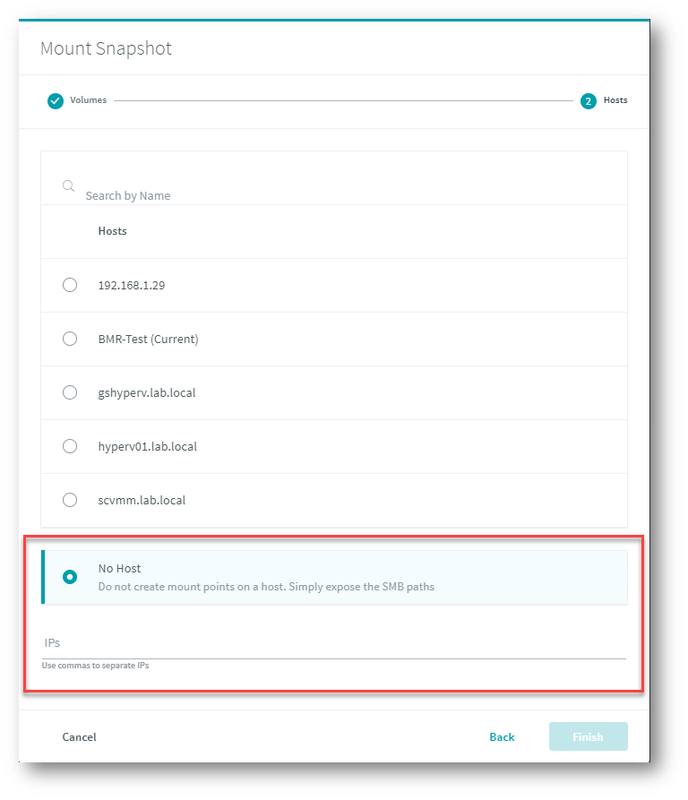 When you hover over the name, it will give you the option of copying the SMB share to your clipboard. When you move your mouse down to the Path all you need to do is click on it to add to your Clipboard. The bottom image is what the share will show in case you’re curious. The part in blue will be just for that mount and need to be changed. 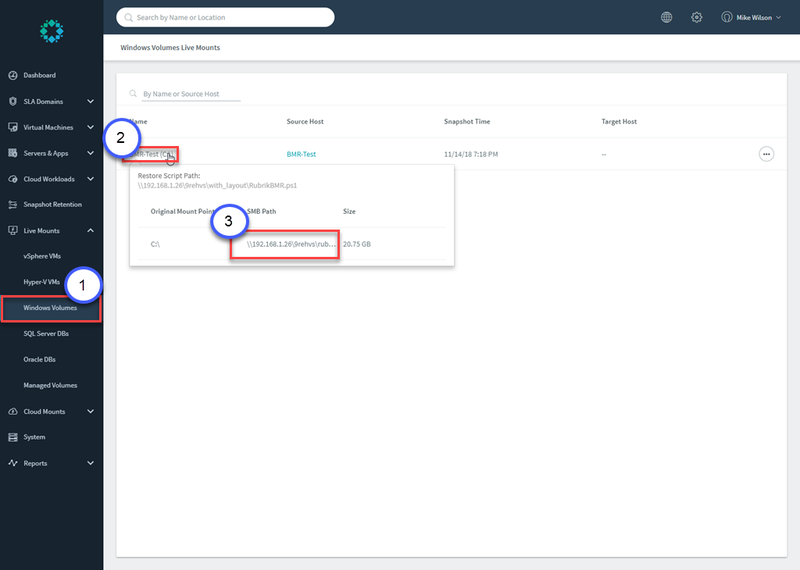 Once you hit enter, a flurry of activity will happen and you will see it copying the data over. Grab a coffee or nice single malt scotch – either will do depending on the time of day. I have a video below of what happened after I clicked enter. It restored 22 GB of files on the C:\ drive in about 15 min. This is over a 1Gb Ethernet connection and using a single virtual node. In closing I love this as a feature and feel it is a great feature with the additional refinements made on this version.